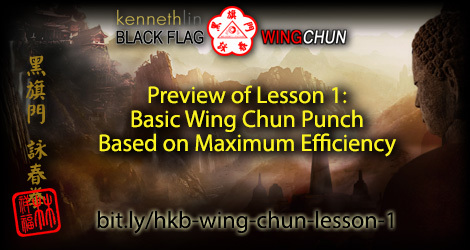 Black Flag Wing Chun Lesson 1: Basic Wing Chun Punch using Maximum Efficiency. You've seen how the Ip man movie have sparks the growth of Wing Chun worldwide. Now learn how to use wing Chun techniques using HKB Eng Chun [Black Flag Wing Chun] to achieve maximum efficiency of time, space and energy. In this video, Grand Master Kenneth Lin demonstrates how to express the maximum combat efficiency using the basic wing chun punch, Im Tiong Kun, through Occupying time, becoming space and releasing an impulse energy. Looking forward to see you next week. © 2014 Hek Ki Boen Wing Chun Online University | Black Flag Wing Chun.